Danke fürs Schaun und einen schönen Abend noch! super jolie ta carte, le tampon est magnifiquement fait ! what a beautiful card,I love the stamps!!! Oh this is adorable! Love this stamp, but haven't got it yet. You did such a great job with it. The sparkle on the wings is very pretty and I love that band-aid in the corner. das ist so schoen geworden. Deine Karte gefällt mir total gut! Schöne Farben und ein superknuffeliges Motiv. Ich sollte meinen Gummi auch endlich mal einweihen *kicher*. Really nice and I love the details! Die ist ganz bezaubernd. Einfach eine süüß Karte. Klasse. I like your stamps !!! Hi. With the PIF once you receive my candy , I think you leave a post on your blog and then you send some caandy to the first 3 people to leave you a comment. Hope that makes sense. If you email me your address I pop the candy in the post to you over the weekend. wow ist die aber toll, vor allem das pflaster ist ja echt goldig, eine richtig tolle karte. Great card and I love the little plaster. Adorable !! le tampon est très beau !!! J'adore ! elle est drôle et tellement travaillée ! 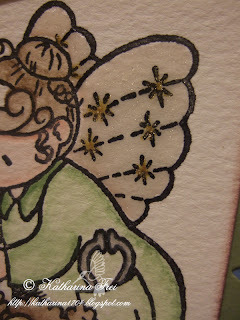 Just gorgeous, what a fabulous stamp, so cute! oh, this is so cute and I love that plaster! Awwwww! she is very cute! 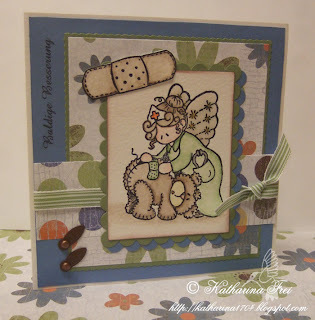 ahhh, that stamp is so adorable and I love the little sticky plaster you have added! oooh, this is just so cute! really beautifull card! I love the stamp, I go now on their website! Thanks for the link!